Apple will release a new MacBook Air at the end of the third quarter, according to Taiwanese research firm TrendForce. That lines up with either September or October, depending on how the wording is interpreted. The report does not provide additional details, but both Apple analyst Ming-Chi Kuo and Bloomberg News reporter Mark Gurman expect Apple to release a new entry-level notebook later this year, and they are two of the more reliable sources as it relates to Apple's upcoming product plans. TrendForce specifically says it will be a new MacBook Air, but Kuo and Gurman have not identified what branding the notebook will have. 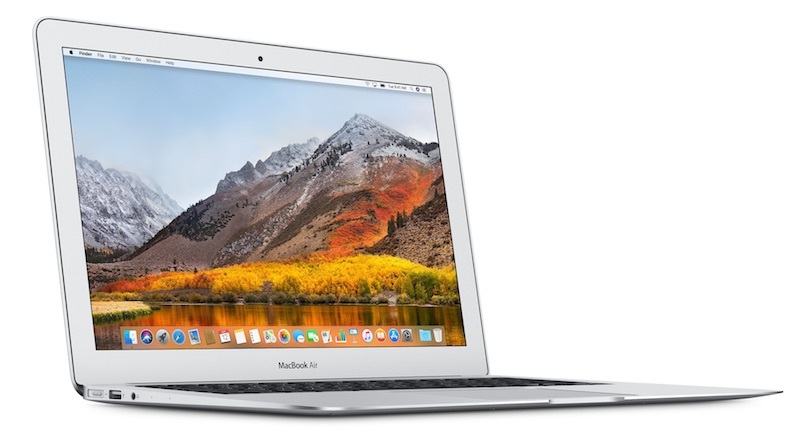 Earlier this year, DigiTimes claimed that Apple will release the first MacBook Air with a Retina display in the second half of 2018, and noted that it will be a 13-inch model in a separate report. This week, it said Quanta will assemble new "inexpensive notebooks" from Apple in the fourth quarter. Whether it turns out to be a MacBook, MacBook Air, or something else, Gurman expects at least one of the entry-level notebooks, if there are more than one, to have a starting price of $999 or less in the United States. Apple could announce availability of a new MacBook Air via press release at any point this fall, or save it for a September or October event. At this point, we lean towards an October release, as the September event should be busy, with a trio of new iPhones, Apple Watch Series 4 models, new AirPods, and more. With refreshes to other Macs expected later this year, including the iMac and Mac mini, and a widely expected iPad Pro with Face ID, Apple may have enough in its pipeline for an October event, which it last held in 2016. Ever asked for is a MacBook Air with a retina screen. "Gurman expects at least one of the entry-level notebooks to have a starting price of $999"
What's Apple idea of entry level? 2GB RAM and 64MB SSD? With zero ports and inductive charging. Nope, people were clamoring for Touch Bar. Yep, and it'll still have the "Industry Standard" (as of about 2007) resolution of 1280x800. "There's something in the Air...and it's not AirPower." Time to see what the future holds for the Apple laptops. Hopefully this new Air will not come with the ****** keyboard. Dear Apple, it's come to this. We would now be happy if you stopped taking away stuff we need and want. The current MacBook Air only lacks a retina screen. Of course we would want more modern ports, but we know you now only take away, so we aren't going to even ask. Please keep literally everything the same except for one thing: add a retina screen. We'll even let you charge an extra $100 for it. Everyone would be really happy even though you've delayed this for six years when it could have been done in a month. Please listen to your customers. No one is happy with the direction of your laptops. No one is happy with how you have overthought and over designed for something few people want. We know what we want, because you've told us what we need and we have rejected it. You've tried it your way for six years. Can you not just try it our way this once? We are asking you to just take the easy money. You won't be compromising your corporate principles in any way. Seems the vocal minority is still grinding on this old keyboard as superior. I'm pretty sure Apple understands preference in terms of the keyboard. If the new one were that hated, it'd be gone. Most people like the butterfly keyboard. Yeah, remember how many people complained about the last generation of keyboard? Oh right. Nobody did. Nobody had an opinion on the last keyboard because nobody should notice a keyboard. It should just be there and just work, like the last generation of keyboard did. The fact that the butterfly keyboard turns off a sizable number of users makes it a design fail right off the bat.